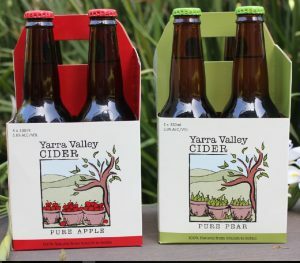 Yarra Valley Cider sources its fruit from local growers and has local Yarra Valley Winemaker Rob Dolan’s team complete the production of our locally produced artisan style cider. Our delivery partners in Visy Australia for our packaging and Oz Pack for our bottling complete this all Melbourne affair. Our cider is produced using 100% juice with no concentrates used during production. We only produce small batches to ensure consistent quality of our Pure Apple and Pure Pear Ciders.